Contra-rotative units reaches considerable pressures. This system, originally introduced by Woods, is now worldwide accepted. 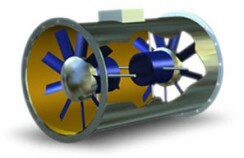 It consists of two or more fans with different guide vanes placed in series. The wings rotate in the opposite direction and are directly attached to the appropriate engines.